The new Bundesliga deal means will bring Germany into line with most other countries in that no single operator will hold exclusive rights to national league football. Sky Deutschland has retained most of its rights to the Bundesliga, Germany’s league football championship, for the 2017-2021 period, but lost exclusivity, as previously reported in Broadband TV News and according to Tim Westcott, Senior Principal Analyst, TV Programming at IHS Technology. Sky will pay €3.5 billion over four years, 80% more than the €1.9 billion it is paying in the current 2013-2017 contract cycle. The 80% increase in Sky’s payment for rights underlines the importance of live league football to pay TV market leadership, and there are obvious parallels with the latest Premier League deal in the UK. 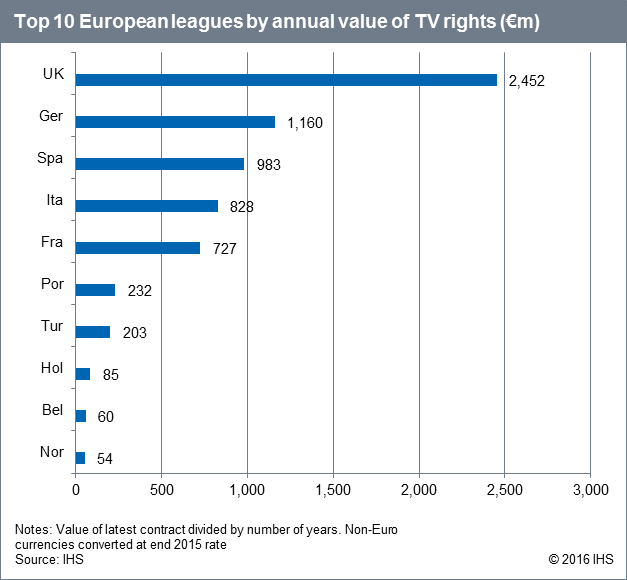 The increase in value of the Bundesliga’s TV rights shows how far the league has come in developing its revenue base. The Bundesliga will leapfrog Spain’s Primera Liga and Italy’s Serie A to become the second most valuable European league. Even so, the Bundesliga (worth €1.16 billion a year) is still far short of the Premier League (€2.5bn). Eurosport’s entry in the market for domestic Bundesliga rights is another sign that its parent Discovery is serious about investing in strengthening its rights portfolio. On an annual basis, the value of Bundesliga rights increased by 87%, less than the 180% for the latest deal for the Super Lig in Turkey and 108% for the rights to the Liga Sagres in Portugal. Sky’s aggressive bid to retain its leadership of Bundesliga rights is similar to the 85% increase in its payment for the new Premier League contract in the UK and Ireland. Eurosport’s entry in the auction means the DFL did not invoke its ‘no single buyer’ rule which would have made one of the live rights packages available for over-the-top exploitation. The new deal means will bring Germany into line with most other countries in that no single operator will hold exclusive rights to national league football.